GreenMotor spent an hour on Friday talking to Andrew Marshall and Boris Jacob, who work for car maker General Motors (or GM - otherwise known in Europe by its brand names Vauxhall, Chevrolet and Opel). Marshall is the Director of Technology Communications for GM Europe, and Jacob is the Chief Designer in GM Europe’s Advanced Design department. 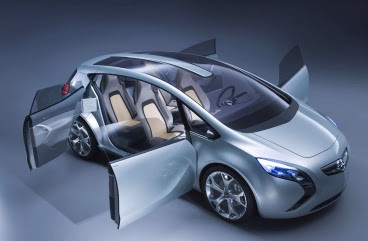 They were in the UK to talk about GM’s plans to reduce the carbon impact of its vehicles in the future, and to let us prod and poke the Opel Flextreme concept car, which debuted at the recent Frankfurt show. This car uses the “E-Flex” architecture that underpins the Chevrolet Volt concept, and is essentially the European equivalent of the Volt. Volt and Flextreme are concept demonstrators for what GM calls the range-extended electric car. The car is propelled entirely by an electric motor, but there is also a conventional liquid-fuelled engine under the bonnet to supplement the batteries. Unlike Toyota’s Prius hybrid, the engine never directly drives the wheels but is on board solely to run a generator for when the batteries run flat. Using an engine to generate electrical power locally may sound inefficient, but it’s actually a well-proven technique used, for example, in diesel-electric trains. For journeys of less than 55km, the Flextreme’s 1.3 diesel engine will remain redundant, with the batteries being recharged by plugging the car in at its destination. GM hopes that the combination of electric drive and on-board generation will provide the best of several worlds - zero tailpipe pollution for urban commutes, and the low-CO2 benefits of electric vehicles, combined with the long range capability of a conventionally fuelled car. Detractors will point out the drawbacks: an engine plus electrics equals redundant weight; when running the generator emissions are not much different from an ordinary car; if you habitually use it on battery alone, the pack will probably need replacing every few years due to cycle degradation; and servicing costs may rise due to the extra complexity of the overall system. Marshall, in turn, argues that the Flextreme has reduced the number of moving parts required because it has no gearbox, and that wear and tear on the engine will be reduced. “Some trips you won’t use it at all, others it will run only some of the time. It also operates in its ideal window,” he adds, meaning that the engine will always run at its peak efficiency, rather than running up and down its rev range in response to the driver’s right foot. GM has established partnerships with battery makers CPI and LG Chem, celebrated US startup A123 Systems, and top-tier parts supplier Continental. As well as “the eco thing”, Flextreme is intended to highlight clever doors: its vertically split side-access hatchbacks would be useful in urban parking situations, but they seem unlikely to make production. Rear-hinged rear doors, meanwhile, are destined to appear for real, according to Marshall. He wouldn’t name the model, but his description of their utility - “great for when you’re strapping-in the kids” - suggests the next Zafira. The interior also features three LCD screens about six centimetres deep, just beneath the windscreen and running the full width of the dashboard, for displaying images from the three rear-facing cameras and satellite navigation systems. From the driving seat it feels reasonably natural to check out the nearside and central rear view in this way, but the offside view - dead ahead of the driver rather than lurking on the door - would take some getting used to. Jacob said cost should not prevent this wide information screen entering production: “These are all off the shelf components,” he said. Although GM has said it will put the Volt on sale in the US by late 2010, it hasn’t yet committed to building the Flextreme, or putting any of the E-Flex technology into future Vauxhall Astras. However, Marshall firmly rejected suggestions that GM is engaged in empty PR exercises. “E-Flex is not just a concept,” said Marshall. In any case, Marshall added, even hybrid leader Toyota still builds big 4x4s. “You could just as easily accuse Toyota of window dressing,” he argued. Jacob said car makers have to take one step at a time, explaining that consumers may want low-CO2 cars but they will still demand a safe, comfortable car with air conditioning. To make real inroads into CO2 emissions, therefore, makers can’t simply build stripped-out cars made of soya curd and canvas and wait for the buyers to come. They need to gradually change perceptions about more efficient cars. “The trick is to move smaller cars into the premium segment,” Jacob said, noting that small is preferable in many other markets - a bigger, fatter phone is not a better phone. BMW’s Mini has shown that a compact car can have premium appeal, and GM would like to follow suit. GM is not alone in that aim, of course. Creating high-value small cars will be vital for makers to meet upcoming EU average emissions rules without splattering their bottom line in red ink.